Location is the best. You can walk to all attraction. The apartment is roomy and complete with everything you need. The host was awesome!! Very informative. Location is just steps away from champs elysees. Spacious apartment. Lock in a great price for Sweet Inn - Rue La Boetie – rated 8.1 by recent guests! One of our top picks in Paris.Sweet Inn Apartments offers self-catering apartments in several locations in the 8th district of Paris. Free WiFi is provided. With 2 bedrooms, this apartment includes a living room with satellite TV. The bathroom is complete with free toiletries, a hairdryer and a shower. Guests are able to prepare homemade meals at Sweet Inn Apartments – Rue de la Boetie. The kitchen is equipped with an oven, a microwave and a fridge. Kitchenware is also provided. Sweet Inn Apartments – Rue de la Boetie is 0.9 mi from Saint Lazare Train Station and 1.1 mi from the Eiffel Tower. Paris – Charles de Gaulle Airport is located 14 mi away. When would you like to stay at Sweet Inn - Rue La Boetie? 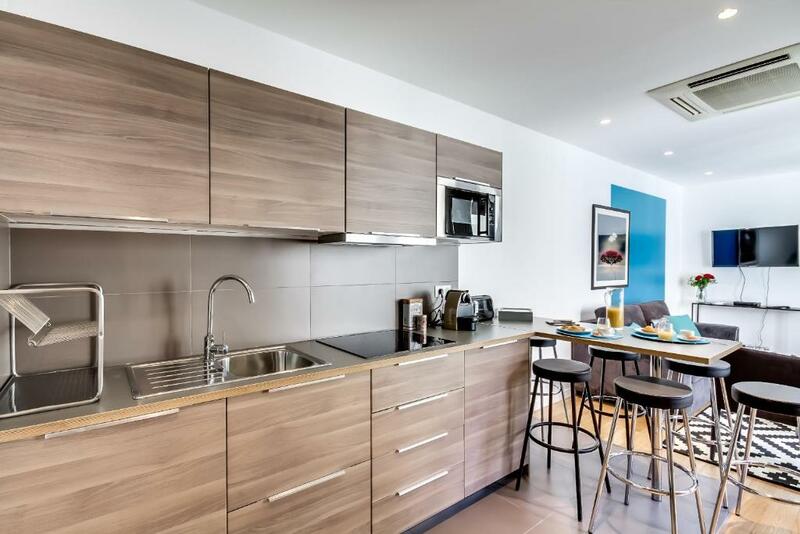 This 1-bedroom apartment offers free WiFi, satellite TV and a fully equipped kitchen. This apartment has air conditioning, washing machine and oven. House Rules Sweet Inn - Rue La Boetie takes special requests – add in the next step! Sweet Inn - Rue La Boetie accepts these cards and reserves the right to temporarily hold an amount prior to arrival. Please inform Sweet Inn - Rue La Boetie of your expected arrival time in advance. You can use the Special Requests box when booking, or contact the property directly using the contact details in your confirmation. 1. The bathroom was dirty. 2. I slept 4 nights in a broken sofa bed. My back still hurts. 3. The apartment’s key did not work the second night and I had to wait 30 minutes outside the apartment for a lady who opened the door. 4. The beds did not have enough covers. 5. The safe box wasn’t working 6. The host that was assigned to us did not helped at all. Then I contact another host who helped us and offered a discount. There were some working in the building so few mornings from 8:30 am the workers used heavilu the drilling machine , no need for coffe or alarm in the morning. :) But the good point is the renovation won't last forever in the building! I think the living room was missing furniture to sit, thinking that we were 5 persons at the apartment. I would also consider to renovate some parts that were not in a "good shape": bathroom furniture, Kitchen top, kitchen table not stable. The garbage bag at the kitchen was missing and a sponge to clean the plates also. I think this should be included in the price. I did not like all the cleaning material in the bathroom and not in a cupboard. Apartment was smaller than expected and condition of apartment was a bit old. Location was brilliant, literally 10 steps away from CE. The response on our questions was just formal, without solving the issue itself. Some equipment was not working. Still there is unclear topic with price charged. Bed is a bit small, need some upgrade. Kitchen has full function but quite small. The toilet - just one in a 3 bedroom apartment which was sort of a nuisance as we were 5 people. However, there were 2 showers, thankfully! The host was a bit disengaged which posed an annoyance when our coffee ran out - he said he would refill the room with more coffee pods but did not deliver on his commitment which was slightly disappointing. Garbage room directions given by the host was strange and we did not find it, so we improvised and used the garbage points down the street. Make sure to check this info out from the host properly to avoid any disappointment and inconvenience. The location was everything - apartment was right next to Champs-Élysées avenue so it was amazing to walk around to cafes and restaurants, and some of the monuments. The apartment was nice and big - we were 5 people, so it was great and it had an open kitchen which was also useful. The building had an elevator which was a blessing, and the unit had a famous neighbor too!! Grocery shop was just downstairs which was fantastic! The opposite building is in constructing now, it is pretty noise in the morning. The host is really nice to us, easy to communicatte with,so polite and they are willing to provide lugguge deposit service in their center office, which is near to the Louvre. The apartment is modern, clean and grande, with a perfect location near to the famous street Champs-Elysées. There is a lot of shop and restaurant around the street. We had a lovely vacation in Paris and wish have the chance to come back in the future.